I’ve harped on about my new interest in skincare for sometime so I won’t repeat myself too much. In summary, I turn 30 this year and my skin was speaking that loud and clearly. I noticed after returning from South Africa that it had aged, significantly. Perhaps it was my penchant for sunshine (and the odd “electric beach” session) but my skin now takes effort. When Guinot got in touch I was intrigued. I’d heard about them from a friend who swore blind by their “lunch break facials” but in truth I was far more of a “home salon” type of girl. 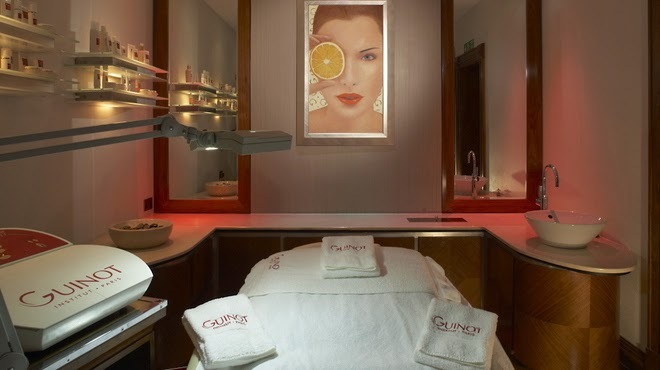 I met up with Aman, Guinot’s Marketing Manager, for coffee and was so impressed with her understanding of my skin-woes I couldn’t have signed up for a treatment quick enough. I went for the prescription style facial called the Hydradermie2, which lasts around an hour. After being given what I can only describe as the plushest salon-bed to sit in I have ever come across, my skin was checked over, inch by inch. I had areas of dehydration and (to my glee) fine lines they were fully confident they could reduce. I was skeptical until the beauty therapist spoke through her theory, “If don’t give a flower enough water it shrivels and wilts. The same applies to your skin.” I then got a stern telling off for not drinking enough what, and my hangover was busted within minutes just by a brief look at the skin under my eyes. With that mind set she set about giving me the various masks and cleansing my face needed. Finally (but most importantly) she massaged my skin with electric "ionizers" which effectively deep cleanses the skin as it penetrates far deeper than any other type of therapy. By the end, I could hardly believe my (now much more perky) eyes. I looked so much better. Like so much better. If you fancy doing the same you can – Guinot’s products are available to buy across the UK – have a look at their site here. I’ve been using the anti fatigue eye gel and hand cream religiously since going. But in all honesty, you kind of need to see it to believe it – so get yourself to the salon. As previously mentioned if you are short on time they do a “pit stop” lunch break facial, but I can’t recommend the longer facial enough – an eye-opening experience. Thank you Aman and Guinot, my skin is genuinely so much better for my visit! Guinot Australia here - what a marvellous post and site - just love it. We cannot agree more with you and so glad you are in love with the Guinot Hydradermie. Sounds like you may also love the NEW creme eye fresh if you love the anti fatigue gel. It is a staple in our purses for that quick dash from day to night out.